After a busy weekend, we were all ready to relax and enjoy just being together. We decided to try watching the cartoon Ratatouille as a family and it was actually a big hit. 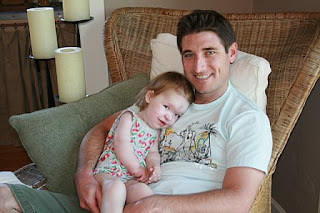 The movie was fine, but Gwendolyn most loved sitting in the big chair and snuggling with Daddy. I asked her several times, Do you like snuggling with Daddy? And she grinned from ear to ear while coyly nodding in the affirmative. So sweet.